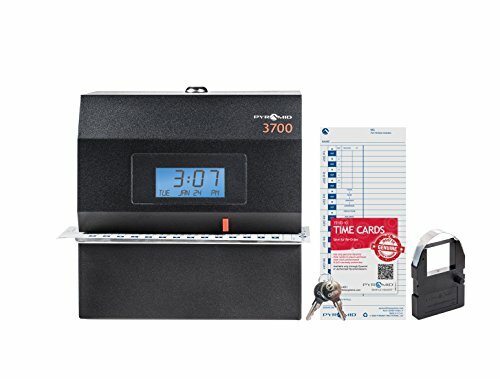 The Pyramid 3700 Heavy Duty Time Clock and Document Stamp stands up to the harshest work environments to perform employee time tracking, job costing and document stamping. The protective steel casing is ideal for garages, manufacturing, warehouse, industrial or construction settings. Track employee arrival times, breaks, lunches, and departure times, or choose from 14 preset messages to stamp time-sensitive paperwork such as attendance logs, invoices or legal documents. Features alignment guide for accurate punches and stamps. Convenient side loading document feed provides flexibility for right or left hand printing. Choose from English, Spanish or French printing. Includes 25 time cards, ribbon and 2 security keys. Proudly made in the USA. Pyramid is an Original Equipment Time Clock manufacturer in the United States and has been producing time clocks since 1969. Pyramid Time Systems takes pride in designing, engineering and manufacturing quality products using premium materials right here in the United States. All of our time clocks, time clock systems, wireless clocks and accessories undergo rigorous operation, endurance and temperature testing to guarantee optimum performance, dependability and customer satisfaction.